Exontrol's ExSkin is an ActiveX control that enables you to change the visual appearance of your project's forms, providing you with the skin (or look&feel) support. Now you can do: any kind of window captions, frames, client and non-client areas and more. 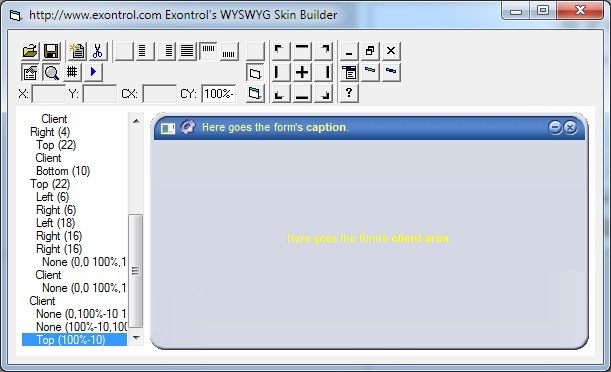 Also, the control contains a WYSWYG Skin Builder component that helps you to create new "skins". So, it is possible now to make your program look like any program from MacOS, BeOS, Unix, and create your Winamp-like user interface. New! Ability to display the hierarchy of objects that composes a skin in the control's WYSWYG designer. Simple to use ( as placing it to a form, and loading a skin file ). Ability to save files as compressed or uncompressed formats. Ability to assign a skin file to MDI windows and frames as well. Ability to load multiple pictures in a single skin file. Ability to load skin files from BASE64 encoded strings. Ability to load skins at runtime, as well as changing the skin for any non-top window. eXTab The Exontrol ExTab component is a SKIN based TAB control. A tab control is analogous to the dividers in a notebook or the labels in a file cabinet. eXSkinBox Exontrol's new ExSkinBox offers you skinable message and input boxes that can display HTML format and custom images as well.